Home » ballpoint pen » Fine Writing Instruments » fountain pen » montegrappa » Montegrappa Copper mule » Montegrappa Fortuna » Rollerball Pen » Montegrappa Copper Mule Collection - New with FREE MUG!!!!! Montegrappa Copper Mule Collection - New with FREE MUG!!!!! For most of us, a refreshing quaff is all it takes to drive away anxieties. And, what could be better than a mix of your favorite vodka with ginger ale and pinch of lemon to lighten up taste buds? Yes, I am talking about Manhattan's famous Moscow Mule cocktail. Considered as the cocktalian masterpiece of early 50s, Moscow Mule was first introduced by John G. Martin - an executive at the Heublein drinks company. 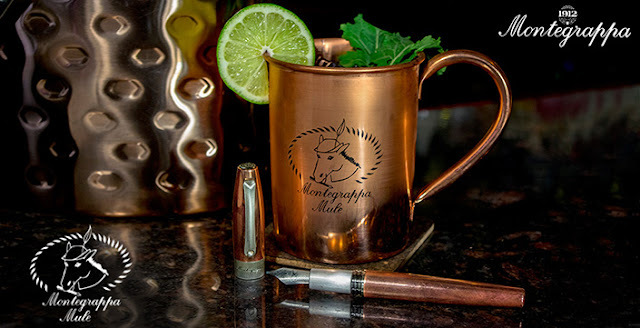 Montegrappa Copper Mule is an excellent series of writing instruments inspired from the reputed Moscow Mule cocktail. Everything about Montegrappa Copper Mule is refreshing, its design and functionality will offer you a smooth writing experience, and take you away from what we know today as "Pen Problems". Curvaceous yet contemporary, its classic copper look is a reminiscent of the Copper mug in which the famous cocktail is served. Plus, its vintage Montegrappa profile will remind one of the piping and tubing concepts implied in the process to produce Grappa. The barrel and cap of the pen is crafted from copper – a hygienic element that eliminates germs and reduces their growth. The sophisticated design of the pen is further adorned by brushed silver-plated trims and cap band that reads Montegrappa - bringing out the discerning artistry of Montegrappa experts. The Mule series of writing instruments are crafted from the same elements used to design the famous Fortuna pens. In short, the Mule series is an extension of the Fortuna heritage. Being inspired from a famous spirit, it still reflects the persona of Fortuna Goddess and embodies her sheer beauty onto it. The Mule series is available in 3 writing modes: fountain, ballpoint and rollerball pen. Each Montegrappa Copper Mule comes in a beautiful gift box with a matching copper mug that carries the spirit of the Moscow Mule. The cleaver construction of the pen features a swift screw-on cap. The cap comes off with a slight movement of wrist - within two rounds. The elegant clip on the cap has a convenient roller wheel at the bottom, which helps to pull the pen out from pockets without the fear of tearing fabrics. Inside is a sturdy steel nib with an etched name of Montegrappa highlighted by Montegrappa's traditional filigree pattern. The fountain pen is available in Fine, Medium and Broad, and takes either a cartridge or converter as refill. The rollerball version of the series shares similar dimension with the fountain pen and includes a screw on cap. The ballpoint pen features a convenient twist-action mechanism, and includes the same clip featured on the fountain and rollerball series. The mesmerizing charisma of the Montegrappa Mule series is derived from its finesse construction that amalgams timeless elegance with functionality. The refreshing Mule series will definitely take you away from the pens that lead to a scratchy writing experience. And for pen enthusiasts who are constantly in hunt for fabulous writing instrument the Mule series will add up as a great collectable in their pen arsenal.